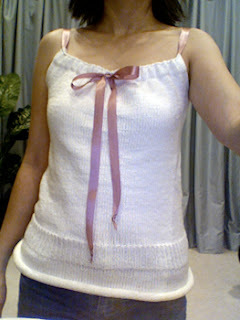 Notes: This was easy breezy--a perfect summertime knit. The only thing I found is that if you "pre-gather" the casing, the rouching looks better when you have your ribbon in. To do this, just follow the directions for whipstitching the live stitches to the inside of the gament to make the casing. Then, pull your working yarn to form a gather. I confess I then tied a knot even though I know that's a no-no! Finally, weave in the tail like you normally would. The pink ribbon I have here is what I had on hand (no beads--that's just not me), but I also intend to experiment with green, brown, and maybe white ribbons. Wow, that looks great! And only 3 balls of Calmer, huh? Tempting! How sweet I comepletely love this pattern! I think that Ill make this next!! I was working on another pattern with Calmer "back in black" from Lisa over at yarn play, but I think Ill do this one! Thanks for the inspiration!